Stirling Council had a problem. The A811 road between Stirling and Loch Lomond, Scotland, was overrun with speeding drivers breaking the 30 mph limit on the stretch of tarmac around Arnprior, a small village. During an April 2013 meeting of the local council, the issue of traffic calming measures was debated. “Road markings plus additional traffic calming measures” were proposed near Arnprior. Sounds reasonable enough, right? That's what Arnprior residents thought, until they viewed the resulting markings separating the route's two lanes. 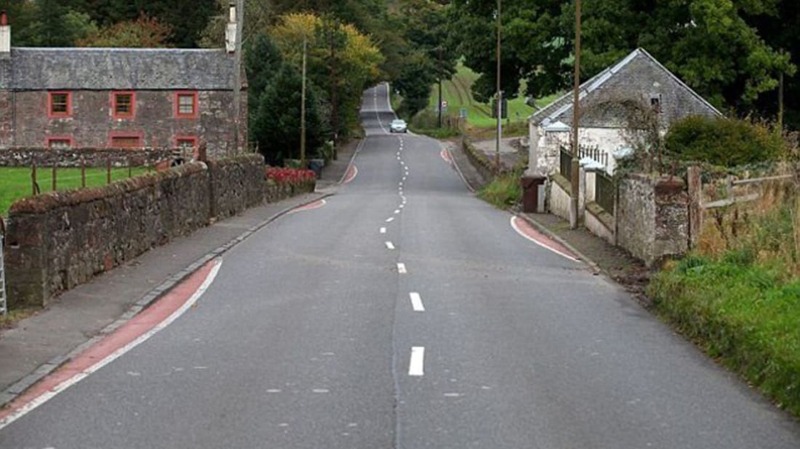 Rather than straight, even lines demarcating the direction of traffic, residents and drivers on the A811 were greeted by wiggly white lines that veered from side to side. The wavy markings weren't a mistake—they were deliberately painted that way in an attempt to slow down speeders. Local residents did complain to the press, though, and one opposition councillor said that the cost of painting the lines wonky, rather than straight, was 50 percent higher than normal. The aim is to trick drivers into thinking that the road surface is uneven, and that they should slow down. But the optical illusion seems less than convincing. The theory behind it is sensible, even if the way it was carried out wasn’t. A study by Leeds University found that vertical shifts in the carriageway—which the road markings were meant to mimic—reduce average driving speed by more than any other suggested traffic calming measure, including narrowing the width of a road. Simply put, people don’t want to risk their car going airborne by speeding too fast over the brow of a hill. What’s more, the road markings intended to reduce speed and increase safety may in fact have had the opposite effect. The strange paintwork drew the world’s attention, and became something of a tourist attraction. Even so, the village of Wimborne, located in South West England's district of Dorset, tried to play a similar trick on its drivers last year, resulting in equally outraged residents. Realizing how unpopular their decision was, Wimborne's town council members were quick to reject the (wiggly) former party line. "After recent resurfacing work the lines were renewed, but the curve in the markings was more pronounced than it should have been," the council stated in a February 2014 release (via the BBC). "We have now corrected this and apologise for any problems this may have caused."